This sonata was commissioned by Lara James and sets out to explore both the expressive and technical features of the instrument. The musical material of the three movements is constructed from arrays of notes, which are generated from an initial twelve note series and then divided into cells. These cells are then used to create motivic material that is used within, essentially, a tonal framework. The first movement, Moderato, is toccata-like and full of nervous energy. The motives repeat and evolve in a continuous development as ideas are juxtaposed and combined. The second movement, Lento flessible, is a languid nocturne with more than a passing nod to the saxophone’s “other life” in the jazz world. The mood of this nocturne is one of relaxed contemplation where all is right with the world. A suitable image might be of someone standing on the banks of the Seine at twilight, leaning against a bridge and watching the world go by. The last movement, Allegro vivo, is a boisterous rondo with five alternating ritornelli and episodes which bring the work to a close. 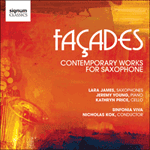 This work was premiered by Lara James and Jeremy Young at the Royal Welsh College of Music & Drama at a concert supported by the Welsh Music Guild, in April 2005.